A cookie bake off challenge. You know exactly how these things get started... a bunch of people are sitting around and someone says they have come across the greatest peanut butter cookie recipe ever. Not to be outdone, another person chimes in that their Grandmothers peanut butter cookie recipe is the best ever! And yet another proclaims that their cookie recipe would knock the competition out of the kitchen. Before I realize what is happening, I'm in the middle of cookie bake-off challenge! The rules: Peanut butter must to the star, you have to taste it in every bite. The Judges: The entire rest of the office. didn't have them. They are hard to find; and I didn't think about this aspect until after I got to the store. By that time it was too late! 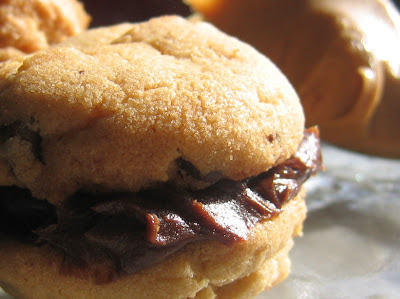 So if your not a chocolate fan (whatever) or you find yourself in a peanut butter cookie contest, try these using peanut butter chips instead of chocolate - they are tasty! Seriously, this little cookie contest spurred more office discussions than the Obama-Hilary debate! The debate over wheth er people could/should actually vote for the cookie with chocolate spurred discussions that was passed from group to group until the final decision lay with the big guy! I suspect we will have more of these challenges and I'd also wager that due to the success and 'controversy' of the first one, I'll be seeing more challengers as well! Bring it on, it will keep me on my toes. And I'll keep pushing the limits of the rules even if that means I don't win. Because as long as I'm cooking and baking, I am fat and happy! 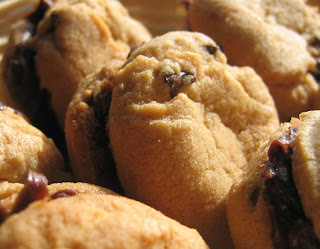 Drop small scoops of cookie onto an ungreased sheet pan (I used my smallest cookie scoop). Bake for about 12 minutes, until just lightly golden brown. You don't want to over-bake these or they will be too crumbly; they will almost seem not quite done when you take them out. Let them sit on the pan for about 5 minutes before you move them to a cookie rack to cool. Pour into the glass bowl - stir until chips are melted and everything is creamy. Place this in the fridge until cooled, but spreadable. Once your cookies and filling are chilled, assemble by spreading filling between two cookies!